Elisapee of the Arctic: Mallikjuak Adventure should be in every school library in Nunavut by now as I sent copies for the 42 schools in the province. An April, 2011 reading at the Pickering Central Library to a thrilled audience of grade 4, 5 and 6 students shows the story has universal appeal for students dealing with family and identity issues. The full text is available as an e-book here. 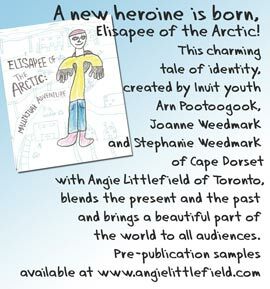 This charming tale of identity created by Inuit youth Arn Pootoogook, Joanne Weedmark and Stephanie Weedmark of Cape Dorset with Angie Littlefield of Toronto blends the present and the past and brings a beautiful part of the world to all audiences. After three readings of Elisapee of the Arctic: Mallijuak Adventure, nearly 150 young people have spoken. The following comments are from the readings at the Varley Gallery in Unionville. There was a total of three readings at the Varley Gallery. "I loved the whole story. As a young writer, I found the book very inspiring. I loved the plot, the setting, the pictures and the message. I can't wait to hear more of these stories..."
"I absolutely had a wonderful time. The book is totally enjoyable; Nunavut is so pretty. I also write books. You are awesome." "I really liked in the end when she comes back home and when somebody to her a new diary." "I think the story is amazing. I love it when they teach you a lesson of never running awy from home. I also like how they describe the island. You can imagine it in your mind." " I am proud of Elisapee when she came back home where she belongs." "I think the story was very good because I like how you have a little bit scay but also have a good moral. I loved it." "I thought the story was really interesting and meaningful for kids and parents. Great job on the story. Kids this book will teach you don't run away from home." Angie Littlefield has been an educator for 33 years, and is a freelance writer, curator and editor. Angie, with three Inuit youth aged 11 and 12 and with the help of Ontario mentors, wrote and illustrated this beautiful children's story.